This magnificent creation is but one of his exquisite soups that accompanied unique sandwich-extravaganzas. Prepare Artichokes: cut off the top 1/4" tip of the Artichoke. With kitchen scissors, cut off the tips of all outer leaves. Cut off the bottom of the stem, leaving only 1/4" of the stem base. 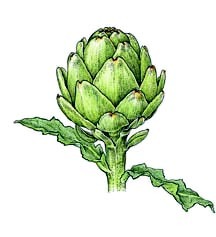 Make an "X" on the base of the Artichoke stem to allow even cooking. Bring one gallon (16 cups) of water with the lemon juice to a boil. Add prepared artichokes, cover and boil for 30 minutes. Drain and place Artichokes in an ice water bath to cool. Make a roux: melt the butter and add 2 tablespoons of the olive oil; add the flour and stir till well-blended and bubbling. Remove from the heat and set aside. Pull off the outer Artichoke leaves and twist off the inner, pale-colored leaves; slice their pale, tender bases into slivers and set aside. Holding the stem in one hand, scoop out and discard the fuzzy choke from the center of the heart. Slice the heart and stem into slivers and set aside. In a 4-quart stock pot, add 2 tablespoons olive oil, Garlic, Onions and Celery; sauté till tender. Stir in the sliced Artichoke hearts, stems and leaf slivers. Add fresh Oregano and chicken or vegetable stock. Bring to a boil, stirring occasionally. Stir in heavy cream and bring to boil. Add the roux, stirring constantly, until it thickens and boils again. Add Cayenne Pepper and salt to taste. Serve piping hot. Serves 8 to 10.